Globstar Europe Satellite Services Ltd, a wholly-owned subsidiary of Globalstar, and Ovinto have announced that Sabic, a supplier of petrochemicals, will equip its entire European fleet of 500 rail tank cars with Ovinto Sat M2M satellite-based tracking and monitoring technology. The company uses its European fleet of rail tank cars to transport chemicals. By selecting the Atex Ovinto Sat M2M asset tracking solution, Sabic has taken a significant next step in its focus on safety in the production and transport of chemicals. Additionally, the new technology is helping Sabic to optimise its supply chain operations and to enhance partner relationships. Because Ovinto Sat relies on Globalstar’s next generation LEO satellite constellation, Sabic benefits from the network’s reliability and reach to obtain timely, accurate information about the status of every asset in its fleet. This helps ensure that Sabic as well as other stakeholders have immediate access to data in order to act more speedily and efficiently. Meanwhile, Sabic is able to track each vehicle on its journey in real time so it can have an accurate understanding of delivery times. This enables Sabic to immediately know whether a rail tank car has been loaded or unloaded or is ready to be redeployed. Ovinto Sat supports Sabic in its constant focus on safety and to maximise the value and efficiency of its assets. "Sabic is a major provider of petrochemicals with customers who use our chemicals and plastics for many different applications. 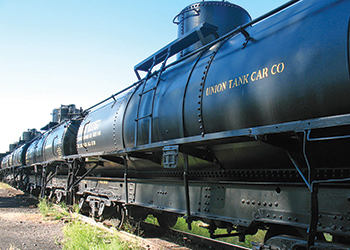 One of the transportation means we use is our fleet of rail tank cars. Keeping track of a large fleet of these cars, dispersed all over Europe, is crucial," says Judith Kleinen, category manager Land Transport & Spot Shipping Supply Chain, Chemicals at Sabic. "Our rail tank cars contain all sorts of materials, it is absolutely critical that we have the ability to track and monitor the status of the rail tank cars and their contents at all times." "Thanks to Ovinto Sat and Globalstar, we are in an even better position to service our customers and suppliers and all the other stakeholders in the supply chain in order to get the materials they need when they need them and to be assured that our fleet is being used as efficiently as possible," she concludes. The Atex Ovinto Sat solution provides oil, gas and chemical industry customers with details about cargo being transported and its condition, including pressure and temperature, whether it is in the correct location, or has been impacted due to a crash or derailment. Satellite is the preferred option for such communications due to its availability, reliability and low power consumption compared to GSM. At the heart of Ovinto Sat is Globalstar’s low power, tiny STX3 chipset. Since it is battery powered, Ovinto Sat enables customers to monitor hazardous materials in unpowered environments including rail tank cars and tank containers. Because of its very low power consumption, the Ovinto Sat battery can last up to eight years. Ovinto Sat collates data from various sensors and GPS in each of Sabic’s rail tank cars and sends it securely by satellite to the customer headquarters at regular user-defined intervals. "Sabic’s choice to install Ovinto Sat in all if its rail tank car fleet in Europe is a strong endorsement of the solution and its ability to reliably monitor remote assets wherever they may be," says Corry Brennan, Simplex regional sales manager, EMEA, at Globalstar, says: "When materials are being transported across Europe it is critical that the location of assets be always known, but also whether those assets and their contents face risks. Only satellite can deliver continuous, reliable, power-efficient connectivity with these assets in order to ensure safety but also to help maximise operational efficiencies." Frederick Ronse, Ovinto CEO, comments: "To ensure efficient and reliable transportation of chemical materials across vast distances, uninterrupted monitoring is critical – relying on GSM alone simply cannot guarantee this connectivity."